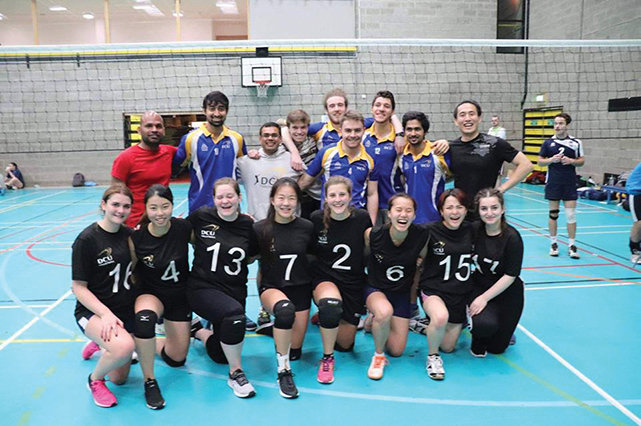 DCU Volleyball at the intervarsities. DCU Volleyball will return to the drawing board and hope to rebuild on their recent defeats at the Inter-varsities indoor championship in UCD at the weekend. While the DCU Ladies team powered their way to the Plate final and finished in 5th place overall, the DCU Men’s team unfortunately ended their weekend in second last place with defeats to UCD, DIT, Carlow IT, and GMIT, securing just one victory over Tallaght in a last place match. The DCU Women’s team on the other hand got off to a shaky start drawing all their pool matches against Trinity, Sargent’s College and NUIG, losing their first sets to all three teams. According to DCU Volleyball coach and Irish international Benny O’Regan he claimed it was better that the Women’s team were put into the Plate and not the cup because the UCC team looked like they were never going to be stopped as they walked their way to the cup final with a team made up of mostly US and Canadian All-Stars. DCU ladies luckily overcame Athlone IT by one point in the quarter final, coming from behind to defeat University Ulster in the semi-final before losing 24 points to 10 to Cork IT in the Plate final. When talking about Irish volleyball in DCU, O’Regan said “The reliance on Erasmus students comes from young children not being exposed to the sport at a young age like they are with sports that are on grass like GAA or soccer. O’Regan stated that Irish volleyball is not even near the same level as other European countries such as the French, the Italians or the Spaniards who come out of proper schools and clubs who live for the sport and also have a much larger population. DCU now will play a tournament in Kilkenny on the last week of November in their final competition before the college closes for Christmas. In early 2019 they will part take part in the UCD Mixed Blitz which is a competition made up of 24 teams before preparing themselves for the Junior and Intermediate Championships later in the semester. “We try and partake in as many matches and competitions as we can. “The sport in DCU hasn’t truly developed much in my time here but all you need is one team to make something special happen,” said O’Regan.